The Eternal City is a glorious place to visit all year round. 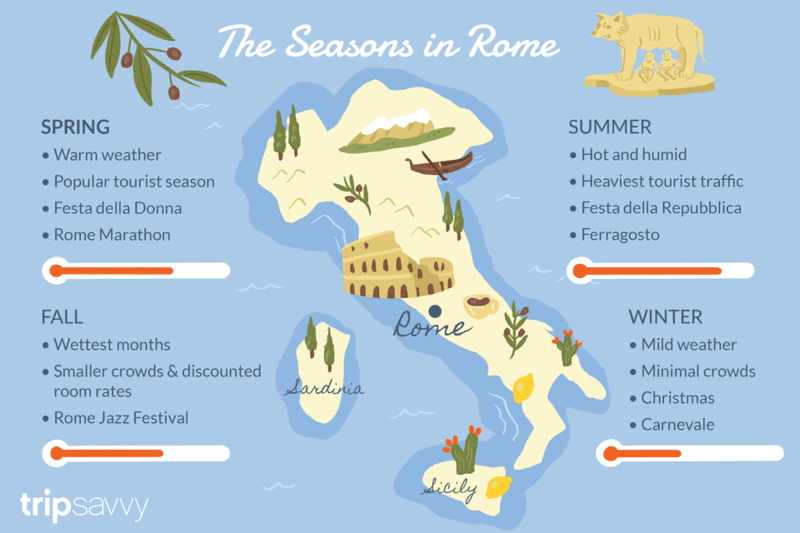 There's really no "bad" time to visit Rome, but keep in mind that July and August can be hot and humid, and December through March are on the chilly side. Most would agree that the best time to visit Rome is between September and November and April to May when the crowds are fewer, days are bright and sunny, and evenings are crisp and cool—usually only requiring a light jacket. But no matter what time of the year you decide to travel to Rome, before you make your vacation plans it's a good idea to consider a number of factors, including crowds, weather, special events, and budget. Rome has a Mediterranean climate with cool, wet winters and hot, humid summers. Temperatures in July and August can easily exceed 90 degrees Fahrenheit (32 degrees Celsius), with humidity to match. The rest of the year's climate is pleasant, with low temperatures hovering around 40 degrees Fahrenheit (4 degrees Celsius). December, January, and February are the coldest months of the year, though the mercury rarely dips below 30 degrees Fahrenheit (-1 degree Celsius). Snowfall is not unheard of, although it rarely accumulates. October and November are Rome's rainiest months. June, July, and August see the heaviest tourist traffic in Rome because many people take their holidays in the summer during the school break. If you decide to visit during the high season, be prepared for large crowds and long waits in lines at popular attractions. Rain is possible, but unlikely, making summer the ideal for sightseeing, dining at outdoor cafés, and eating gelato, which is why so many travelers plan their trips during this time. Spring and fall are also popular seasons for travelers. March weather is slightly more variable (and chillier) than April when the city begins to warm up. Holy Week (Easter Week, which depending on the lunar calendar is between March and April) is an exceptionally busy time in Rome, particularly as you get closer to Vatican City. Meanwhile, the light is never as golden and luminous as it is in October and November. Keep in mind that these are some of the wettest months, but fall can be a great time to take advantage of smaller crowds and discounted room rates. Not to be counted out, winter is actually a really good time to visit, especially for those who want to save money on lodging, and see tourist attractions and sites in the historic center without the long lines and crushing crowds. December through February sees relatively mild weather, allowing you to slow down and take in everyday Roman life, but be sure to pack a heavy jacket, a hat, a cozy scarf, and warm gloves. In January temperatures dip, but sunny days are also likely. Considered Rome's low season, there are still quite a lot of things to do since The Eternal City never closes. The biggest New Year's Eve celebration is in Piazza del Popolo, capping off the year with music, dancing, and a sparkling fireworks display. The Epiphany on January 6 marks the 12th day of Christmas. Also on January 6, a good witch, La Befana, brings candy to kids and a morning procession of medieval costumed people takes place at the Vatican. January 17 is Saint Anthony's Day, celebrating the patron saint of butchers, domestic animals, basket makers, and gravediggers. Not unlike January, February in Rome is cold but almost devoid of tourists, which means you'll have free rein to enjoy the capital at a leisurely pace. Rome's Carnevale, the celebration of the start of Lent, is not as famous as Venice's but it's fun all the same. Spring can also be a busy time in Rome because thousands of Christians flock to Rome during Easter Week (falling sometime in March or April) to visit St. Peter’s Basilica and the Vatican Museums. Many hotels charge the highest price during this period. International Women's Day or Festa Della Donna is celebrated on March 8. Ash Wednesday marks the beginning of Lent, with a Papal Audience that morning. Get tickets online at The Holy See's website. When Holy Week falls in April, festivities culminate with Easter (Pasqua) mass in Saint Peter's Square, filling to capacity with nearly 80,000 pilgrims. Good Friday festivities begin with a 5 p.m. mass in Saint Peter's Basilica, followed by the Via Crucis, a torch-lit procession. Easter Sunday mass is held at St. Peter's Square at 10 a.m. The Pope addresses the crowd at noon. On Easter Monday (Pasquetta), the Pope holds a mass on Saint Peter's Square at noon. The Rome Marathon is held in April each year. In the days following Holy Week, there's a bump in tourism, so be sure to make your airline and hotel bookings early. May 1 or Primo Maggio is a national holiday marking Labor Day—the celebration of the worker. Swearing in of the new Swiss Guard happens at the Vatican on May 6. In early to mid-May, Rome hosts the Internazionali BNL d'Italia (Rome Open) at the Stadio Olimpico tennis center. In June, you'll see a distinct rise in the number of tourists with young children, so be sure to book reservations to the most family-friendly sites ahead of time. Festa della Repubblica (Republic Day) is observed on June 2, commemorating the day in 1946 when Italy became a Republic. The Festa di San Giovanni is an important festival with a celebration of dancing, music, and food. Historically the hottest month of the year, temps can reach near 100 degrees Fahrenheit (38 degrees Celsius) and it can be quite muggy. Beat the heat inside churches and museums during the day, strolling along the streets at night, when Rome is at its most vibrant. Lungo Il Tevere Roma is a hip and happening event featuring in which temporary pop-up bars, restaurants, food stands, and music venues line themselves along the banks of the Tiber River. August can be as hot as July with temperatures soaring under the intense Roman sun. However, since this is the time many Romans like to head to the seashore, the city can be surprisingly quiet. Isola del Cinema offers a summer film series on Tiberina Island, in the middle of the Tiber River. Ferragosto (the Assumption) lands on August 15, a time for BBQs and the realization that summer in Italy will soon come to an end. As kids go back to school, crowds start to thin out somewhat in September, and weather becomes a wee bit more pleasant. Days will still be warm, but you'll feel autumn temperatures starting to creep in on cool evenings. The Sagra dell'Uva (Festival of the Grape) is a harvest event held early in the month at the Basilica of Constantine in the Forum. The start of the all-important soccer (calcio) season! Forza Italia! Fall colors and cooler temps abound, and so do arts, crafts, and antique fairs. Rome Jazz Festival in late October. Winter is just around the corner, but blue skies and warm afternoons linger. All Saint's Day on November 1 is a bank holiday in remembrance of the dead. Feast of Saint Cecilia at Santa Cecilia Church in Trastevere is on November 22. As you might imagine, Christmas in Rome is magical, with elaborate nativity scenes everywhere and brightly colored lights strung throughout the streets of the historic center. During Hanukkah, go to Piazza Barberini to witness the lighting of a giant menorah. Browse the Annual Christmas market in Piazza Navona. Christmas Eve at the Vatican is where the traditional unveiling of the Baby Jesus occurs at the life-size nativity. Midnight Mass on Christmas Eve is a special Roman tradition.